State Chief Deputy State Fire Marshal Bill Spurgeon (left), Genoa Township Fire Chief Gary Honeycutt (middle), and Ohio Bureau of Workers’ Compensation Administrator/CEO Sarah Morrison (right) discuss a grant the township received for firefighter safety during an event held Tuesday. 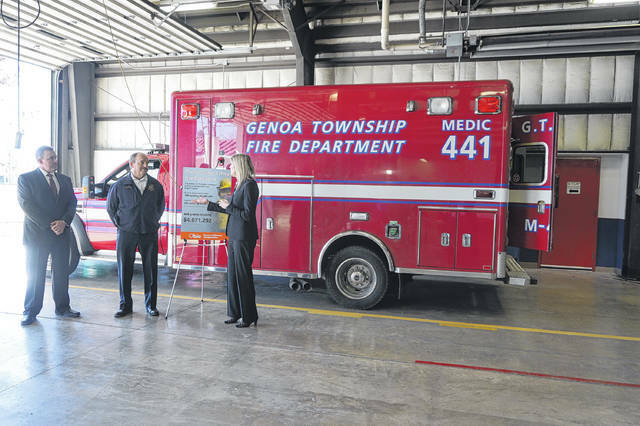 There was a brief, yet important, announcement given at the Genoa Township Fire Department in Galena on Tuesday. The fire station on Big Walnut Road was the site of an announcement made by the Ohio Bureau of Workers’ Compensation (BWC) aimed at promoting its “Firefighter Exposure to Environmental Elements Grant Program.” Genoa used a $10,075 grant to purchase an industrial washing machine to replace a 1995 model. To look at the white washer, it seemed little different than a typical household appliance. However, this larger unit was an “extractor,” an industrial machine that meets National Fire Protection Association standards. The National Institute of Occupational Safety and Health said because firefighters are exposed to carcinogenic chemicals during a fire, they have a higher risk of being diagnosed and dying from cancer than the general public. The extractor allows all gear, such as gloves and helmets, to be washed prior to the next shift. Bill Spurgeon, the state’s chief deputy fire marshal, said he was “delighted” to partner with the BWC on the grant program. According to the BWC, 199 grants totaling $2 million have been awarded with four months remaining in the fiscal year. There are 245 other grant applications pending. The event was one of many that tied in with Gov. John R. Kasich’s (R) final State of the State address, which he gave on Tuesday at Otterbein University in Westerville, near his family’s home. Correspondingly, these events were spread throughout Central Ohio, as far west as Marysville and as far east as Newark. https://www.delgazette.com/wp-content/uploads/sites/40/2018/03/web1_DSC02310.jpgState Chief Deputy State Fire Marshal Bill Spurgeon (left), Genoa Township Fire Chief Gary Honeycutt (middle), and Ohio Bureau of Workers’ Compensation Administrator/CEO Sarah Morrison (right) discuss a grant the township received for firefighter safety during an event held Tuesday.